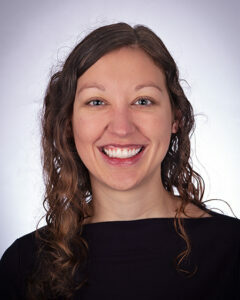 Dr. Kiri Bagley is a first year fellow in pediatric nephrology. I enjoy spending free time outdoors, particularly hiking and biking. I also love to bake. I enjoy traveling and exploring new places, especially when this involves the outdoors. Why did you choose nephrology? I found the scientific and clinical details of nephrology fascinating as a medical student. As I progressed through my clinical training, I found myself gravitating toward the nephrologists – they were always outstanding teachers who demonstrated great enthusiasm for their work. Nephrologists also develop strong longitudinal relationships with patients and families, a rewarding aspect of the field. What are you looking forward to during your fellowship time here? I look forward to learning more about pediatric nephrology and working with such a fantastic group of clinicians and educators! I am excited to begin my career in pediatric nephrology here at the UNC Kidney Center, which provides such a variety of opportunities for participating in research, clinical care, and public outreach activities. What do you like best about Chapel Hill? I love the wealth of outdoor activities that is readily available, both in the immediate Triangle area and within just a few hours’ driving distance. Welcome to the UNC Kidney Center, Kiri!